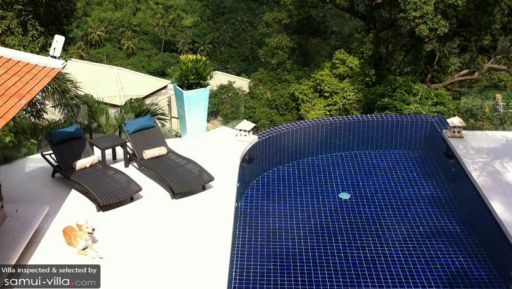 Villa Blue Samui is a three-level vacation residence that exemplifies contemporary tropical elegance. Consistent white interiors are furnished with beautifully crafted pieces as well as equipped with hospitality grade fittings – all to ensure a fun-filled and completely comfortable guest experience. 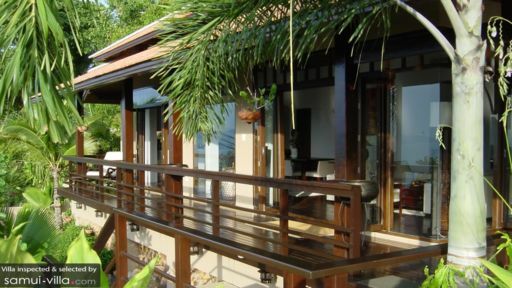 Erected on a hillside rising from Bang Po Beach, Villa Blue Samui bestows exquisite vacation living with an appeal that’s, at once, cozy and homey. The villa’s master bedroom is on the third level while the villa’s two guest rooms are on the second level. All bedrooms are connected to exclusive bathrooms. The master bathroom, though, is semi-open and has a rainforest shower and a fitted bathtub. All three bedrooms also open out to balconies with fantastic views of both the landscape and the seascape. At the center of the villa’s ground-level exterior stone deck is the glistening, eight-meter infinity pool that overlooks the amazing hillside greenery as well as the open sea. At one end of the pool is a scenic sala that’s fully-furnished for nothing but downright relaxation. The exterior stone deck blends into the breezy common space where the living area is fixed. Adjoining is the indoor dining area – although alfresco dining can also be laid out by the pool. Thai culinary feasts can be concocted at the villa’s ultra-modern kitchen. Should there be a need for connectivity, the villa’s study is equipped with a desktop computer. 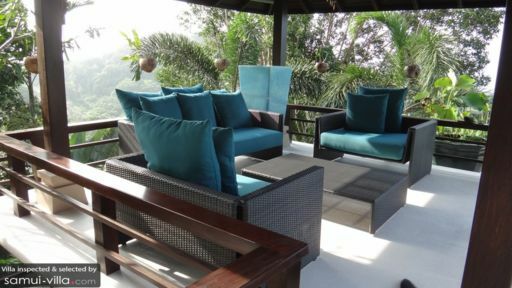 Villa Blue Samui employs an amiable staff that delivers not only daily services like housekeeping, laundry, security and garden maintenance. The staff is also at your beck and call for personal catering, airport transfers and tours. However, these are services not included in your booking and will entail extra costs. On a day out of the villa, you can head to the Hin Lat Waterfall, the Secret Buddha Garden or the Bang Makham Stadium where you can catch a buffalo fight. Go-to in dining places nearby are Starfish, Villa Bianca, Lan Tania, Red Snapper as well as Sala Thai.